12.05.2015: Sivanadane Mandjiny, Indian America Chemistry Professor at University of North Carolina US is named UNC Board of Governors 2015 Award. One professor at each of UNC campuses is named annually for this award. UNC has 17 campuses. The award carried $12,500 cash price and a bronze medallion. 12.05.215: Cyriac Joseph is appointed as the interim chairperson of National Human Rights Commission. He was appointed by president of India, Pranab Mukherjee. He will succeed KG Balakrishnana whose tenure is completed. 12.05.2015: A secular blogger Ananta Bijoy Das was killed in Bangladesh. This is the third such incident in recent times in Bangladesh. In February, Avijit Roy, who moderated Mukto-Mona website was also hacked to death. Ananta Bijoy Das incidentally wrote blogs for Mukto-Mona website. 12.05.2015: Subrata Paul and other three former football national team players Lawrence and Mahesh Gawli and two current players Oinam Bembem Devi and Subrata Paul are recommended for Arjuna awards. The recommendation is made by All India Football Federation. 12.05.2015: Earthquake of 7.4 magnitude struck Nepal again, fifteen days after a quake killed more than 8,000 people. 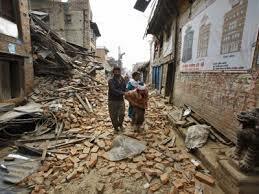 The government put the toll as 65 in the latest quake and revealed that more than one thousand people are injured. Tremors were also felt in many parts of India. In Bihar more than 16 people were killed. 12.05.2015: President of India Pranab Mukherjee appointed new governors for six states. Odisha minister Droupadi Murmu is going to be the new governor for Jharkhand state. Former Jharkhand governor Dr Syed Ahmed will go as Manipur governor. New governor of Arunachal Pradesh is going to be Mr JP Rajkhowa. He will succeed Lt. General (Retd) Nirbhay Sharma who is appointed as governor of Mizoram. Tripura’s new governor will be Tathagata Roy and V Shanmuganthan is going to be the new governor of Meghalaya. This entry was posted in Current Affairs, News on May 13, 2015 by Rakesh.